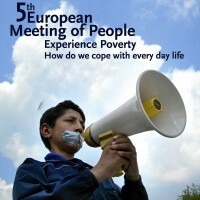 Read the full report of the fifth European meeting of people experiencing poverty which took place on 12 and 13 May 2006 in Brussels under the Austrian Presidency. Participation is essential: It is essential to involve people experiencing poverty in the decisions that affect their day to day lives. Policy makers must listen to and engage in meaningful dialogue at both European, national and local level. Such participation must be regular, be given a formal status and structure and be resourced. Indicators should be agreed for monitoring participation. Coping is a constant struggle: Coping with poverty is difficult. It is a day to day struggle for survival. This is because if you live in poverty you are isolated and lack basic information. Your basic needs such as access to work, decent housing and health and education services are often not met. Even when available, essential services often treat you in a disrespectful, unresponsive and stigmatising manner. Racism and discrimination deepen your exclusion and isolation. You feel powerless, stigmatised and blamed. You lack choice. Inadequate and insecure work increasing: For many, access to decent work is very restricted. Work is often low paid and insecure and not sufficient to lift people out of poverty. Access is worsened as a result of discrimination and racism, especially for the Roma, asylum seekers and undocumented migrants but also for others such as single mothers and disabled people. Fear for one’s children: Many parents fear that the things they missed in their own lives when growing up are now happening to their children. It is not only that children may lack basic necessities or have inadequate access to essential services but that they lack the possibility to participate in normal social, cultural and recreational activities. Human rights and dignity for all: The most fundamental need for a good life is respect for the human rights and dignity of all people irrespective of their ethnic origin, religion or legal status. Every individual person and their story count. An adequate minimum income: In as wealthy a part of the world as the EU every citizen should be guaranteed a sufficient minimum income to pay the bills and lead life with dignity. This should be enough not just for basic needs but also for participation in social and cultural life and for personal development. Enforced anti-discrimination legislation: Strong anti-discrimination and equality legislation which is rigorously enforced and guarantees the right to work and equal access to services for all. Access to decent work: Access to quality work is a key route out of poverty for many, but not all people, enabling them to become active citizens. Such access needs to be supported by linking appropriate training opportunities, supportive social services and flexible income support systems. A roof over one’s head: Decent and affordable housing is essential. This means investing more in building social housing, controlling rents and evictions, prosecuting bad landlords and ensuring respectful housing services. opportunities to participate in affordable cultural and creative activities and in sporting and leisure activities are an essential element in a good life. Access to information: access to relevant and understandable information about rights, services and opportunities is vital to surviving and leading an independent life. Participation of people experiencing poverty and NGOs representing them in the preparation but also the implementation and monitoring of the new NAPs must be extended and deepened. Training on participation techniques should be organised for civil servants responsible for the NAPs. The next NAPs need to be more concrete, focussed and specific and thus more understandable and effective than previous NAPs. Preparation of the NAPs must involve the whole policy system and link different policy fields together. The NAPs should take into account the range of needs that are necessary for a good life and not only focus on activation measures. The impact of the privatisation of utilities (e.g. water, gas, electricity) needs to be taken into account in the NAPs. Ongoing monitoring and evaluation of what has actually happened because of the NAPs need to be strengthened. The Presidency supports the view that participation is essential. Member States should, in accordance with the common objectives for social protection and social inclusion, step up their efforts to include people experiencing poverty. The exchange of information between the Member States on their experiences with the participation of people experiencing poverty should be intensified. In this context the Presidency proposes to focus the debate on sustainable development in the Council on 1 June 2006 on social inclusion and especially on the question how the involvement of people experiencing poverty at all levels could be improved. Poverty is a day to day struggle for survival. In the European Union too many people have to fight this struggle every day. This has continuously to be kept in mind when policies are designed. The issue of access to decent work is of key importance and has to be considered in all the relevant policy areas so that it can work as route out of poverty and social exclusion. The Presidency encourages all participants and guests of the 5th meeting to disseminate the results and experiences of this 5th meeting as widely as possible. The European meetings of people experiencing poverty have proved very useful and should be continued.